Successfully Added VKWorld T1 Plus Kratos Smartphone - Android 6.0, 6 Inch Screen, Quad Core CPU, 2GB RAM, 4G, Fingerprint (RoseGold) to your Shopping Cart. The T1 Plus Kratos is one of the most interesting new releases from Chinese phone manufacturer VKWorld and with its 6.0 inch HD screen it's a worthy contender for those looking for a large screen smartphone. 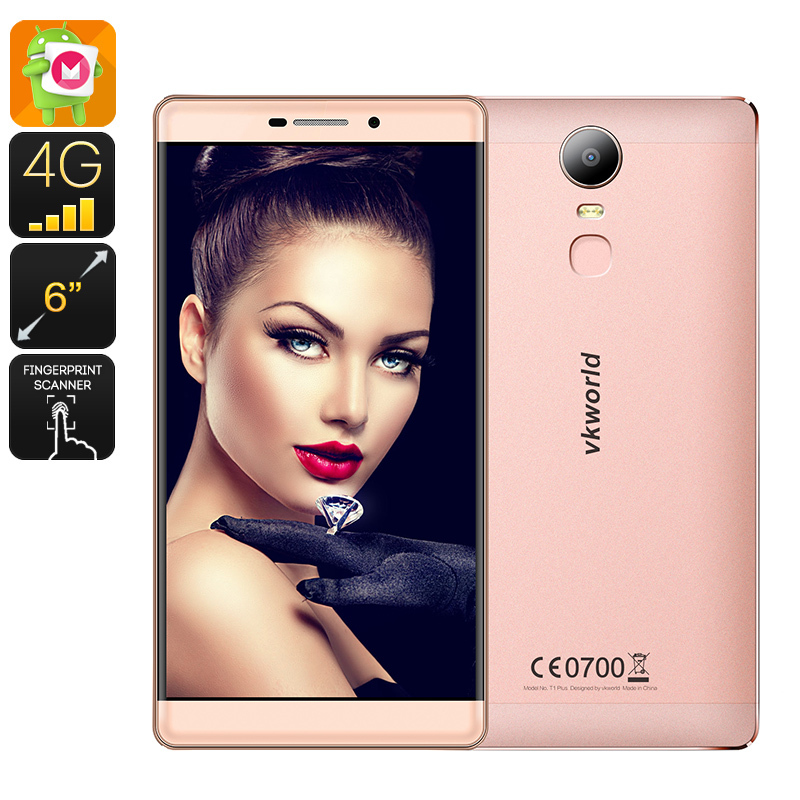 This 6 inch phone has a familiar aesthetics that are attractive to the eye and similar to leading brands. with a metal frame and rear, the phone is smooth to the touch and has a prestigious finish that hard to deny. Featuring a super-fast fingerprint scanner the T1 Plus Kratos smartphone brings state of the are security to protect your data and can unlock the phone in just a fraction of a second from a single touch. The fingerprint sensor not only unlocks this phone but can be used to control the camera, manipulate music playback, swipe through pictures in your gallery and more. Powered by a quad core MTK processor and with 2GB of RAM the phone performs all you daily tasks well and can easily handle games and multitasking. This performance is driven by a swift Android 6.0 OS that brings easy access to all your apps. with 16GB on onboard storage there's sufficient storage for most needs, however, the 64 GB of additional external storage, available through the micro SD card slot should cater to heavy media users. The unique packaging for this smartphone can be converted into a VR box similar to that of the Google Cardboard by following the instructions so you can get a real taste of the virtual world with this phone and watch VR content. This T1 Plus Kratos smartphone from VKWolrd comes with a 12 months warranty, brought to you by the leader in electronic devices as well as wholesale Android smartphones..
Had two of them both in The trash. One stopped working after 24 hours.the second stopped after 4 hours. Black screen. And never to go again. The screen size is perfect. Love the brilliant colors.